Flagstaff is a small city located in the north central Arizona, situated at the base of San Francisco Peaks, a 12,633-foot-high dormant volcano. 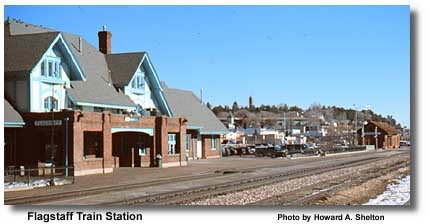 Flagstaff is located at the intersection of US Interstate 40 and US Interstate 17, making it a hub for transport in the Northern Arizona area. 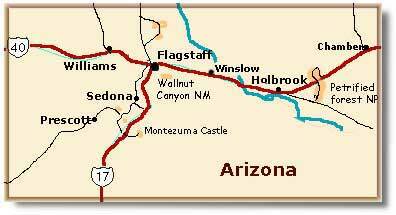 Flagstaff is the county seat of Coconino County, the second largest in the United States, which encompasses the winter ski resort, Arizona Snow Bowl, Meteor Crater, the Painted Desert and Oak Creek Canyon. Flagstaff stands as the gateway to many nearby national parks and monuments -- Sunset Crater National Monument, Walnut Canyon National Monument, Wupatki National Monument, Grand Canyon National Park, and Petrified Forest National Park. It is also home to the U.S. Naval Observatories and Lowell Observatory, Northern Arizona University and the Museum of Northern Arizona, one of the best archeological museums on the Prehistoric Southwest in the world. The three San Francisco Peaks are immediately north of the city, which is encircled by the Coconino National Forest. Local business includes forestry, transportation, manufacturing, and the tourist industry. At 7,000-foot elevation, be prepared for abrupt weather changes in any season. Expect windy conditions most of the year. Spring is usually mild but heavy snowfall can occur. Summer days are warm with temperatures in the eighties. Afternoon thunderstorms likely July to September. Winter days can be cold, snow and ice can cause temporary closure of the Island Trail. Surrounded by dense forests (now called the Coconino National Forest) at an elevation of 7,000 feet, the region has long been, and remains a center for logging. Lumberjacks celebrating the 4th of July, 1876, nailed a U.S. flag to the top of a tall Ponderosa Pine, thus giving the settlement its name -- Flagstaff. In 1882, the Atlantic and Pacific Railroad (now the Santa Fe) arrived and assured the community's growth. Shortly thereafter, local interest in nearby Indian ruins (now encompassed within Walnut Canyon National Monument) gained momentum. These ruins became more well known when lumber magnate Michael Riordan, who was recuperating from tuberculosis in Flagstaff, took a personal interest in them. Riordan was probably the best known and most self-publicized of those pothunters who explored the ruins and removed artifacts over the next 25 years. But as early as 1891, local citizens became alarmed at the scale of looting and destruction of ruins, which occasionally involved dynamiting walls and rooms to allow for more light. The Flagstaff Chamber of Commerce, recognizing the tourist value of the ruins, denounced the mutilation of the cliff dwellings in 1891, but no formal steps were taken to protect the ruins until they became part of the San Francisco Mountain Forest Preserve in 1904. While a timber-based economy still prevails in the Flagstaff area, since 1900, the tourist industry, augmented by the area's scientific developments and the proximity of Glen Canyon Dam, are added economic assets. The Grand Canyon is located approximately 120 miles North of Flagstaff. Meteor Crater, the world's largest intact meteor impact crater is located 35 miles East of Flagstaff. The Arizona Snowbowl is located on the San Francisco Peaks and is the major ski resort and winter fun site for the area. Coconino National Forest surrounds the area and provides many scenic views, trails and outdoor recreation opportunities. Northern Arizona University is one of the 3 state universities in Arizona. January: Playthings of the Past. 928-774-6272. February: Flagstaff Winterfest. 928-774-4505 or 800-842-7293. March: Archaeology Day - Museum of Northern Arizona. 928-523-5661. April: Voices from the Past - Lowell Observatory. 928-774-2096. May: Great Fiesta del Barrio & Fajita Cook-off. 928-526-3186. June: Route 66 Celebration - 928-774-1330. July: Festival of Arts & Crafts Extraordinaire. 928-774-5213. August: Flagstaff Festival of the Arts. 800-266-7740 or 928-774-7750. September: Annual Bed Race. 928-774-1330. November: Annual Holiday Lights Festival. 928-779-7979 or 800-435-2493. December: Holiday Tours at Riordan Mansion. 928-779-4395. Cameron Arizona: 51 miles north. Tuba City, Arizona: 77 miles north. Sedona, Arizona: 29 miles south. Page, Arizona: 133 miles north. Holbrook, Arizona: 89 miles east. Winslow, Arizona: 57 miles southeast. Jerome, Arizona: 52 miles south. Walnut Canyon National Monument: 10 miles east. Wupatki National Monument : 23 miles northeast. Sunset Canyon Volcano : 8 miles northeast. Navajo National Monument : 135 miles northeast. Monument Valley Tribal Park : 163 miles northeast. Grand Canyon National Park (South Rim) : 83 miles northwest. Grand Canyon National Park (North Rim) : 209 miles northwest. Canyon de Chelly National Monument : 213 miles east. Montezuma Castle National Monument: 55 miles south. Tuzigoot National Monument : 75 miles southwest. Petrified Forest National Park: 123 miles east. Red Rock State Park: 44 miles south. Slide Rock State Park: 31 miles south. Dead Horse Ranch State Park: 75 miles southwest. Coconino National Forest: 10 miles east. Kaibab National Forest: 30 miles northwest. Oak Creek Canyon Natural Area: 5 miles south. Glen Canyon National Recreation Area : 135 miles north. Navajo Indian Reservation: 20 miles east. Hopi Indian Reservation: 50 miles east.